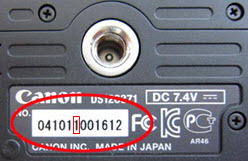 PLEASE SEE THE CHANGES TO THE "PRODUCT RECALLED FOR REPAIR" SECTION BELOW REGARDING THE LIST OF AFFECTED SERIAL NUMBERS. Affected cameras that exhibit this phenomenon will be inspected and the rubber grips will be replaced free of charge. If you own one of the affected cameras please contact our Customer Support Center. This information is for residents of the United States and Puerto Rico only. If you do not reside in the USA or Puerto Rico, please contact the Canon Customer Support Center in your region. Please register your EOS Rebel T4i. By registering, we will be able to notify you via email when service updates are available.